Obtain your 1 oz 2019 Canadian Maple Leaf double incuse silver coin at the guaranteed lowest price from our online store! The harmonious marriage of innovative, cutting edge minting techniques and classic meticulous artistry add to this highly sought after addition from the Royal Canadian Mint. This rendition marks the 31st (?) anniversary of the silver leaf and features the intricate Walter Ott maple leaf design which quickly elevated the status of this coin among investors. This edition is distinguished by the “stuck in” or “incuse” starburst field of intricate light refracted radial lines; additionally it is encircled by the country of origin, weight, and purity. The radiant incuse striking is also present on the obverse of this coin, which maintains a simplistic and skilfully engraved portrait of Elizabeth II making this a double incuse coin. Joining this incuse feature on the obverse, Elizabeth II’s name, the year of issue and the coin’s unique denominational value. This edition employs a novel striking method that serves to make an already exquisite coin even more breathtaking and there is no doubt that this coin will enjoy above average investor approval. Build your wealth in ounces with this special edition and purchase your 1 oz 2019 Canadian Maple Leaf double incuse silver coin now! Obverse Effigy of Queen Elizabeth II and the words "Elizabeth II 5 Dollars 2019"
1 oz 2019 Canadian Maple Leaf Double Incuse Silver Coin Obtain your 1 oz 2019 Canadian Maple Leaf double incuse silver coin at the guaranteed lowest price from our online store! The harmonious marriage of innovative, cutting edge minting techniques and classic meticulous artistry add to this highly sought after addition from the Royal Canadian Mint. This rendition marks the 31st (?) anniversary of the silver leaf and features the intricate Walter Ott maple leaf design which quickly elevated the status of this coin among investors. This edition is distinguished by the “stuck in” or “incuse” starburst field of intricate light refracted radial lines; additionally it is encircled by the country of origin, weight, and purity. The radiant incuse striking is also present on the obverse of this coin, which maintains a simplistic and skilfully engraved portrait of Elizabeth II making this a double incuse coin. Joining this incuse feature on the obverse, Elizabeth II’s name, the year of issue and the coin’s unique denominational value. This edition employs a novel striking method that serves to make an already exquisite coin even more breathtaking and there is no doubt that this coin will enjoy above average investor approval. 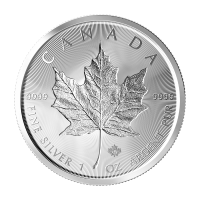 Build your wealth in ounces with this special edition and purchase your 1 oz 2019 Canadian Maple Leaf double incuse silver coin now!